The Daily Cat: 'Smart' Cat Bowl -- Your New 'Purrsonal' Assistant? 'Smart' Cat Bowl -- Your New 'Purrsonal' Assistant? New in the How Much Cat Care Help Do We Really Need category: A "smart" bowl for cats. It lets you know whether you've already fed your cat and how much she ate. 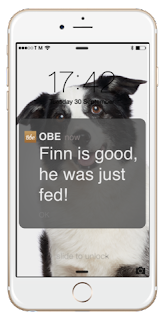 And when the cat food's running low, the smart bowl will use Amazon's Dash Replenishment service to order more. All you need to make this purrsonal assistant work is an Obe ProBowl or two, WiFi and, of course, your phone. You'll need the ProBowl app, too. While your cats will probably let you know if you've forgotten to feed them, the ProBowl provides some other information that the cats might not share. A smart scale weighs your cat's food when you put it in the bowl so you know you're feeding the correct amount. Then the scale tracks and reports on how much your cat's eaten during the day. ProBowl can also track your cat's water intake. Since it remembers everything your cat eats and drinks over time, it can alert you to changes you might not notice on your own. 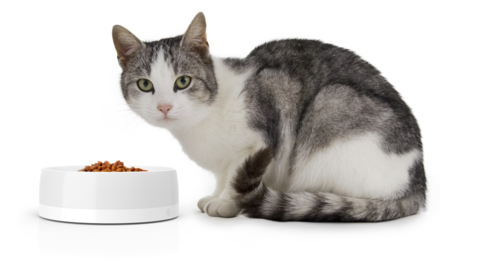 The whisker-friendly bowl is dishwasher safe and has a smart base that connects to your WiFi and phone. A ring on the base lights up when you've put the correct amount of food in the bowl and changes from green to red to indicate the cat has been fed. Last year, ProBowl won Nestle Purina's first Pet Care Innovation Prize. It also won a 2016 Red Dot Product Design Award. The first bowls are expected to ship this spring. More important than being smart is a bowl like this one, which is whisker friendly.